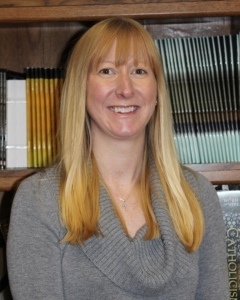 Amy joined the St. Paul Parish Office staff in 2018. She grew up in Leawood, KS, and attended Notre Dame de Sion High School. She received a Bachelor's degree in Accounting from Syracuse University in New York, a Master's degree in Accounting from the University of Kansas, and is also a CPA. Amy and her husband Richard have two kids, Benjamin and Alaina. In addition to being passionate about her faith and family, she is also a Senior level Figure Skater, bronze level judge and group class instructor. Amy began her career at PricewaterhouseCoopers in Kansas City. She is excited to bring her talents to St. Paul and assist in any way possible.